Now that my daughters are grown, I try to go to NYC with my husband when he travels there on business. I get a free room (with free continental breakfast and wine and cheese at night) and sometimes my flight is free thanks to frequent flyer miles. So it’s a sweet deal. The only downside is that my husband is working all the time, so I’m on my own. But that makes it easy. There’s no compromising over the day’s activities. I do what I want. Eat when and where I want. And when I’m tired I go back to the hotel and crash. On my last day there I headed to a nearby Salvation Army. This particular store is a sad, sad rundown store (8th Ave. and 21st St.) and on this trip the dishware/knick knack shelves were almost totally empty. Seriously…empty. I’ve never seen that in a thrift store. But I did find five vintage books, including a 1960s Happy Hollister book (I used to love reading these as a kid.) and an inscribed and signed “The Pleasure of Italian Cooking.” I knew this was a winner. (My research is showing that these are currently for sale at $30-$45) My total for all five books…$3.43. Thank you Salvation Army!! No joy however at a Goodwill (14th St. near 5th Ave.) I visited next. Very clean and organized complete with a security guard. Some good merch, but a tad pricey. The only thing that intrigued me was a long-handled brass sauce pitcher. Price? $29.99. Eeeek! I enjoyed looking around, but honestly wasn’t going to buy anything…certainly not another black leather jacket! But the Austrian/German styling and workmanship on this was just too fabelhaft. I’ve seen jackets like this in wool or velvet, but never in leather. It’s got besom pockets trimmed in dark green leather and offset with red leather, horn buttons and the back features a belt detail and an open pleat. 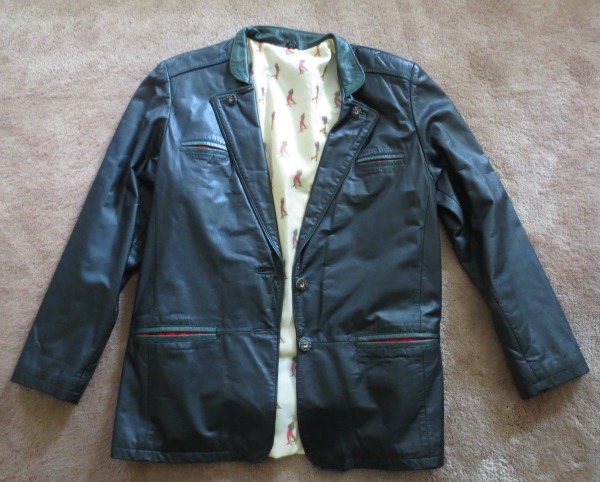 Okay it wasn’t a steal, but it was a good price for a leather jacket and there’s room for profit. 🙂 This was in the women’s section, but I think it’s actually a man’s jacket. And lunch? I went to a tiny place recommended by my dear friend Lauri. Tea and Sympathy (Greenwich Ave.) was enchanting. 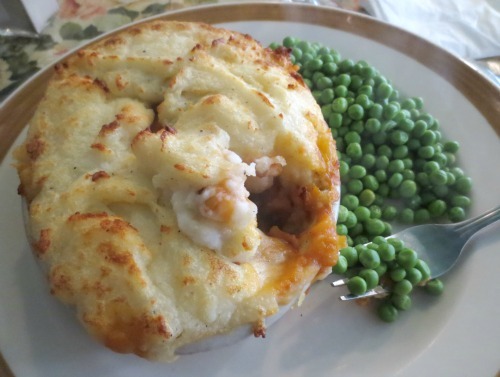 I got the lentil shepherd’s pie which was delish! The only downside to the day…I passed by a restaurant that had 40 (yes 40) nice wood chairs on the sidewalk FREE for the taking and I couldn’t take a one! Now I’m back home in California and back to real life!